Betsey DeVos. Courtesy Howard University. Betsy DeVos, the new Secretary of Education, subscribes to a philosophy of education that privileges, first and foremost, the belief that an education should teach children what parents want them to believe. At first glance, this may not seem so unreasonable. What parents do not want their children to grow up to be like them? But to apply this logic to our nation's public schools is to fracture and undermine the principles on which public education stands. Devos' call for voucher programs and taxpayer-funded charter schools not only threatens religious freedom, but risks the health of our democracy as well. Although the first schools in America (1600s) were founded prior to the separation of church and state and modeled on England’s parochial schools, American Christians themselves soon lobbied for secular education—in the spirit of Jefferson—lest one religion or sectarian belief system be elevated above another. Horace Mann, arguing in defense of religious liberty in his Final Report to the Massachusetts State Board of Education in 1848, pithily summarized the inherent problem with public, parochial education: “If a man is taxed to support a school where religious doctrines are inculcated which he believes to be false, and which he believes that God condemns, then he is excluded from the school by the divine law, at the same time that he is compelled to support it by the human law. This is a double wrong.” Many Christians of the past agreed. DeVos appears to be no different. Prior to her appointment as education secretary, DeVos outright admitted that her policies undermine the strength of secular public education and strengthen certain Protestant goals. School choice, also known as voucher programs, she has said, lead to “greater Kingdom gain.” Rob Boston, spokesperson for Americans United for the Separation of Church and State notes that “people support school vouchers for different reasons...because they are opposed to public schooling...[or] want to prop up sectarian teachings with taxpayer money,” but that DeVos has an interest in both. However, since DeVos has become secretary, she has chosen to use the more palatable rhetoric of the free market when advancing her educational policy, lest her agenda be interpreted as a direct attack on the First Amendment. 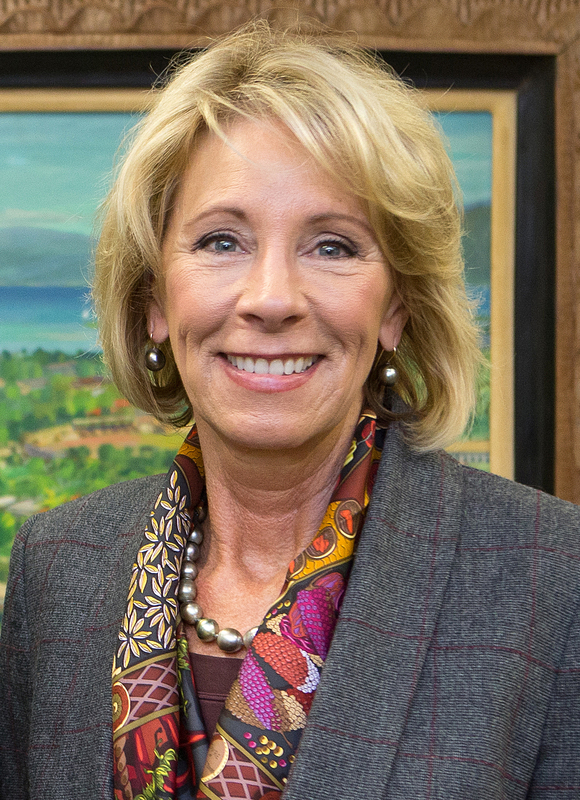 In her first speech as education secretary, DeVos emphasized the need for innovation in public schools, claiming somehow that our system is ineffective precisely because it hasn't changed in decades: a blatant falsehood that does not account for the often unwelcome changes—such as the frequent standardized testing wrought by No Child Left Behind and the more recent implementation of Common Core—that happened under the leadership of her direct predecessors. In the same speech, DeVos advanced the idea that if we don't open education up to competition, we will never see "the education[sic] equivalents of Google, Facebook, Amazon, Paypal." This comparison is a strange one, as the companies that she venerates exist, primarily, to profit off of people rather than to contribute to the public good. In the same vein, DeVos' recent statement at the Brookings Institution, that choosing a school should be like choosing between an Uber, Lyft, or taxi, indicates a fundamental misunderstanding of education's purpose and its possibilities. But for many others, knowledge for knowledge’s sake is exactly what an education should be. A few years ago, The Telegraph pitted an educator against a businessman to debate this subject. Kieran McLaughlin, the headmaster of Durham School—an independent, coeducational boarding and day school for students three to 18 in England—argued “the epitome of an education should be the Arnoldian ‘best of what has been thought and said’ and the measure of any civilization, of any culture, is the extent to which learning is held as important.” His sparring partner, Michael Mercieca—the CEO of Young Enterprise—took the already elucidated view of education as technical preparation for a specific career move. I find this version of education to be idealistic, but also closest to what Jefferson and the other Founding Fathers hoped for the American populace — and the farthest from what DeVos envisions. Those, like DeVos, who support voucher programs and taxpayer-funded charter schools do not want to ensure all children receive the best education, but they do want to ensure their children receive the right education. And what qualifies as right is overwhelmingly based on shared class, race and religion. Make no mistake: the application of free market principles to educational access results in greater choice for a few to the detriment of the majority. When children must use vouchers to apply for spots in the schools of their choice, the system ensures the majority of students do not benefit by design, because only a minority can ever be accepted into the most desired institutions. Additionally, this system creates a pipeline whereby the majority of schools receive less and less funding, as a few select institutions amass an even greater share of taxpayer dollars. By undermining public schools as the center of their communities and instead using them to segregate children into culturally homogenous social pools that replicate the worst of our social divisions, DeVos' educational policy stymies the very possibility of enrichment that occurs when children of diverse backgrounds come together. When it is at its best, the American public school system is a government service providing access to information, training, and knowledge irrespective of class origin or religious belief, with the bonus ability to help high achievers reach—through education—for a more prosperous or culturally rich future. DeVos' educational policy is a direct affront to this ideal. The American public school system, what Wood once called “the supreme achievement of American democracy and the greatest institution produced by American civilization,” is now demonized by the words of its leader. More than ever, educators, parents, and students should remember their power—collectively and individually—to shape the country we call home. The shape of education in the next century will be determined by the actions of those individuals who today have the experience and memory of a robust public education system in the past. There is no reason to forfeit the values and qualities of that social good. We can start by filling school boards with retired teachers and experienced administrators who do not wish to see their decades of service undone in a few years’ time. While contemporary developments in education at the federal level may be disheartening, they should not be interpreted as inevitable or permanent. If anything, they should be motivating. It’s time to get to work. Laura Jean Moore’s essays, stories, and poetry have been featured in VICE, the Brooklyn Rail, the EEEL at the Los Angeles Review of Books, and elsewhere. She holds a BA from Reed College and an MFA from Columbia University.